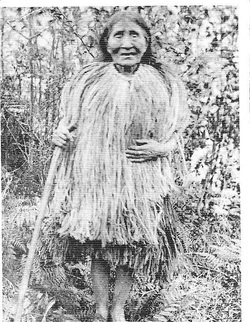 The Pacific Northwest Indian cultures and customs, as well as details of food, housing, tools and dress are recorded in a large body of ethnographic evidence which compares to Francis Fletcher’s descriptions of the Natives and we will examine each. John Jewitt, James G. Swan, Clara Pearson, Robert Gray’s first mate Haswell, and Astor members Franchére, Ross and Cox all wrote books or journals of their Indian adventures. These documents cover the contemporary period from 1788 to 1812. That was 30-plus years before acculturation began at the limited number of seaports in the Pacific Northwest. The Indian men whom Drake met in the summer of 1579 were wearing fur garments down to the waist and the women wore rush skirts (see photos 51 - 55). Fletcher describes “shell necklaces” which are known as dentalia and found only in the off-shore waters of Puget Sound. They were of great value to the Indians and were used as a symbol of wealth. While Drake’s Indians were covered in fur in the middle of summer, yet Cermeno’s Indians were naked in late fall. It may have been a colder than average year in 1579 when Drake was in Nehalem Bay, though current residents of the Oregon Coast are accustomed to often seeing visitors from the south bundled in their winter clothes while visiting in the summertime. In 1938 ethnologist Verne F. Ray reported a 50-year Mean Maximum Temperature 26 of 62.6 in August, whereas the southern people come from much warmer summer temperatures of 85-100 degrees. Drake’s men wore their winter clothes because of the cold Oregon Coast summers.